"Johnny was a true treasure in the world of basketball. He was the classic 'old school' coach who came to work each and every day with energy and enthusiasm for the game he loved. His zest for life and basketball were unparalleled. 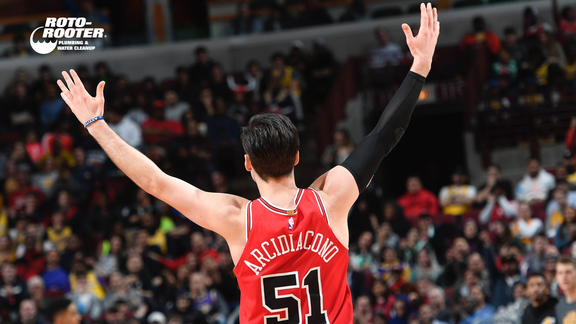 He will be greatly missed by everyone in the Bulls family as well as everyone he connected with during his long tenure in both college and professional basketball." Bach served as an assistant with Charlotte, Detroit and Washington before returning to Chicago in 2003, where he would remain until his retirement in 2006. Before the NBA, Bach was the head coach at Fordham from 1950 to 1968, and at Penn State from 1968 to 1977. He amassed 387 collegiate coaching victories and 16 winning seasons. He was also as an assistant on the 1972 U.S. Olympic team, which advanced to the gold-medal game against Russia. Aside from basketball, Bach was a painting enthusiast. His work was featured at the Sevan Gallery in Skokie, Ill., in 2007. Bach served as a naval deck officer in World War II before beginning his basketball career.